Substance abuse has long been linked to nutritional deficiencies. The empty calories in wine, beer, and liquor reduce the desire to consume a healthy diet, while the urge to seek a high from illegal drugs often causes substance abusers to skip meals in search of their next fix. If you’re in recovery, following a balanced diet can help repair the past damage caused by substance abuse. Proper nutrition will also help alleviate symptoms of withdrawal (such as headaches and stomach upset), reduce cravings, and boost your energy levels. In detox and the early stages of recovery, dehydration is a common concern. It’s recommended that you drink 1/2 ounce to 1 ounce of water for each pound of body weight. For example, a 150-pound woman should try to drink 75 to 150 ounces of water per day. If you don’t like the taste of plain water, try making infused water by adding fresh fruit and herbs to a pitcher of water and chilling it for several hours. Watermelon and mint, citrus and cucumber, or strawberry and basil are a few popular combinations you can try. Current federal dietary guidelines recommend that you fill half your plate with fruits and vegetables for each meal. This is great advice for everyone, but it’s particularly helpful for people in recovery. Citrus fruits are rich in antioxidants, which help boost your immune system, restore the appearance of your skin and hair, and protect the body from free radical damage. Grapefruit is especially beneficial during detox and early recovery because it helps regulate your digestive system while lowering cholesterol and preventing kidney stones. Any vegetable you enjoy is a good choice, although leafy greens like kale, spinach, romaine, bok choy, swiss chard, collards, and dandelion provide a source of chlorophyll to help rid the body of harmful toxins and promote detoxification in the liver. If you’re not a salad lover, try adding leafy greens to a smoothie. Combine 1 cup greens, 1 cup liquid, and 1 ½ cups fruit. The fruit will give your finished drink a sweet taste that masks the flavor of the greens. Whole grains are those that contain the bran, germ, and endosperm instead of losing nutrients while being refined. Whole grains are packed with insoluble fiber, which keeps you from being constipated and helps control your appetite. They’re also high in antioxidants and packed with essential nutrients. Whole wheat bread, brown rice, oatmeal, and air-popped popcorn are the most common types of whole grains. However, more adventurous eaters may want to branch out and try options like quinoa, bulgur, millet, and buckwheat. Protein helps recovering substance abusers repair damaged cells. Wild salmon is an excellent protein source because it is rich in anti-inflammatory omega-3 fatty acids. Salmon can be baked, broiled, or grilled and paired with a side of mixed veggies or brown rice for a filling and delicious meal option. Almonds, walnuts, and sunflower seeds are wonderful choices for snacks since they have enough protein to regulate your blood sugar and keep your mood stable throughout the day. Try making your own homemade trail mix by combining your favorites with dried fruit and a bit of whole grain granola. One serving of trail mix is approximately ¼ cup. You can keep premeasured portions in plastic sandwich bags to avoid overeating. 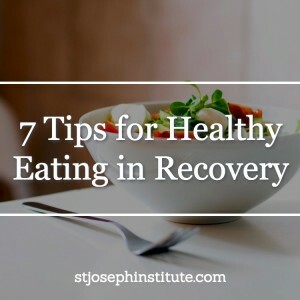 During recovery, one common mistake that people make is replacing their abused substance with fast food or sugary sweets. These foods create temporary feelings of satisfaction, but can result in weight gain along with making you feel bloated and sluggish. It’s best to reserve these items for special occasions only. You may also want to avoid beverages containing caffeine during your recovery. Caffeine provides a temporary energy boost, but can result in mood fluctuations that make it harder to resist cravings for alcohol or drugs. Nutritionists often recommend keeping a food journal to learn more about how different foods affect your mood and energy levels. This exercise can be useful in identifying areas where you need to improve your nutrition, as well as strategies that work well in reducing your cravings.